Joliet is a city of Illinois in the United States. Joliet is 40 miles southwest of Chicago, and is the county seat of Will County. About 106,000 people lived in Joliet as of the year 2000, and about 146,000 people lived in Joliet as of the year 2007. Joliet is one of Illinois' quickest growing cities, and one of the quickest growing cities in the United States.[source?] It is also home to the Chicagoland Speedway used by NASCAR annually. ↑ "Geographic Names Information System". United States Geological Survey. Retrieved 2008-01-31. 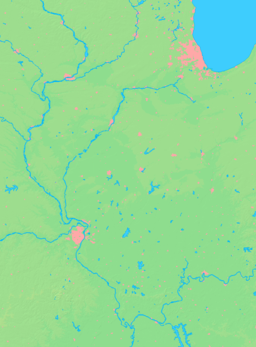 Wikimedia Commons has media related to Joliet, Illinois. This page was last changed on 24 September 2018, at 21:52.